The Producteev team recently learned that Producteev usernames and passwords could have been accessed by an unauthorized third party. 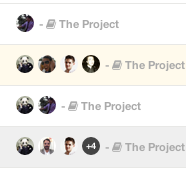 Jive has taken immediate steps to remedy the issue and emailed all Producteev users from support@producteev.io. Please follow the recommendations highlighted in the notification. Note that no other Jive products were impacted. We regret any inconvenience this may cause our Producteev users. Firstly, thank you for using Producteev and being passionate supporters of it. It means a lot to those of us in the Jive products team where we work to shape the roadmap based on your feedback. We fundamentally believe that task management in general and what Producteev offers today can be a key part of the future of our application portfolio. During the first half of 2016, you will be hearing more from us about this direction. One potential we want to explore is the connection between task management and real time team collaboration. We would love to hear your thoughts on this. Do you use real time collaboration tools today in conjunction with Producteev? How do you see the relationship of these two application areas? I want to first thank you for your patience regarding the El Capitan issue in Producteev. We have pinpointed the issue and are currently testing the fix in our development environment. Our goal is to push a fix to the app store this week, and have the fix available to you sometime next week. If this timing changes, I will be updating this space towards the end of the week. Again, thank you for your patience on this. These are some of the features that I'd like to see in the future. Be able to add several tasks to a milestone. See progress of a milestone (e.g. 2/8 tasks done or 25% done). See past, current and future milestones. Able to "close", "re-open", "pause", "resume" and "plan" projects. Semi-secret: Projects where only project title and members can be seen, for example. No details. Locked: Open to everyone to view but only selected users can contribute to the project. After numerous requests, votes and inquiries, we are very excited to announce the release of new features for our web app: The long awaited calendar view plus new ways to sort and show task status. We've also implemented an announcement system (you'll see this when you open any of your installed Producteev apps) to keep you "in the know" when updates happen. Check it out! Instead of just incomplete and complete status, you can now mark tasks as "in progress" or "paused." Sort using a simplified menu with task count based on status and filters (people, project, label, or time period). And toggle to calendar view with a simple click to see tasks due by month, week or day. Plus task details when you click on a task. What's more - creating tasks has never been easier. All you have to do is click on the day you want the task completed, type it in and hit enter. Want to re-schedule a task? No problem! Just drag and drop the task to a new day to change the due date. You can also toggle over to the activity feed in the same view control bar to look at an overview of changes made to tasks in that project. And that's the overview! We hope you enjoy, and look forward to hearing how you like the new functionality. I need to search for information relating to specific name or surname within notes. Has this feature been removed, or was it never functional? To further streamline your task management, Producteev provides a way to filter which projects are visible to you within your network. Projects are an ideal way of organizing tasks across your team and now you can choose to list just those projects that you are involved in. 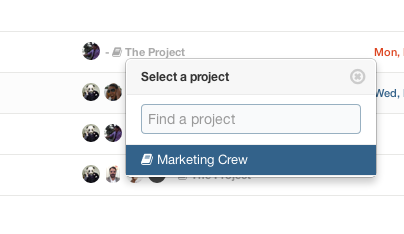 All other projects created by your team members are still available to you via a drop-down menu. Producteev will automatically track which projects are relevant to you through your interaction with them. Any project that you have personally created is listed, along with those that contain tasks you follow or are assigned to. In the near future, you will also be able to explicitly follow or unfollow any project. You can now export your tasks from Producteev. You spoke, we listened. You can now backup your projects by downloading the full history of tasks from Producteev. The CSV export of tasks include Title, Project, Network, Status, Priority, Label, Responsibles (individuals assigned to the task), Deadline, Subtasks, and Notes. The export will give you a complete look at all active and completed tasks. There are two ways to export your tasks from Producteev. Find the Export button in the upper right hand corner of the web app. Click and download your tasks as a CSV file. The second option is to click on your user icon, go to Settings and find the Export tab. The Producteev team has been hard at work this holiday season. The latest update to the Producteev web app features new task filters: "Active and Completed" and "Tasks I'm Following." Available now by clicking the drop-down menu in the tasks header, refresh the app and give these new filters a spin. "Active and Completed" - This was a popular requested task filter that gives project managers a one-look view at what tasks have been completed and what tasks still need to be done. "Tasks I'm Following" - You now have an easy way to access all the tasks you are following! Previously users only be able to receive email updates on tasks they were following. This filter provides an additional view for better visibility and tracking. These helpful filters will be released for mobile in the next release. Assigned users Up to 4 assignees can now be displayed in a row. A circle with the number of extra assignees will be displayed in the event that a task has more than 4 assigned users. Project now displayed in task The task project is now displayed in the task list next to the assigned users. Clicking on the project title lets users move the task to another project right from within the task list. Check boxes vs. Check boxes in the task list are now represented by circled rather than squares to avoid confusion with bulk selection check marks. And finally, new help tooltips have been added in various locations. You can hover over certain actions to see what you can do. These changes as well as a few minor UI updates are now available in the Producteev Jive integration as well. Producteev community, what do you think? [iPhone] Producteev for iOS7 available on the App Store! The iOS 7 version of Producteev is now available on the App Store. On top of providing full iOS7 compatibility, this update is all about “I don’t know what they changed, but I’m glad they did it” (see before/after screenshots at the end of the post). You will immediately notice a color change with way less contrast (that’s Senior Engineer Julien Rousseau's magic touch). We've also slimmed the font to make the app a little more clean and readable. You may also notice a simplified calendar/date picker tool which we will go into more depth about next time. The new look and feel of the app leads to a better experience and users can focus on getting things done. Many thanks to Producteev iPhone developer Jerome Miglino! This update is also packed with tons of little changes, improvements and fixes. Since our launch in May, this is the biggest update we have released! If you don’t want to update to iOS 7, the app remains fully compatible with iOS 6.